The eBook features a great collection of advice from Shelli herself, an accomplished designer, illustrator and online marketer, offering advice broken down into sections: Learning, Curiosity, Mode, Imitation, Connecting the Dots, No Fear, Tenacity, Discipline, and Letting Go. There are also “chapters” contributed by folks like Neil Patel, Rand Fishkin, Chris Brogan, Bas Van den Beld and several others (including me). In fact, I’ve shared my portion of the eBook below. 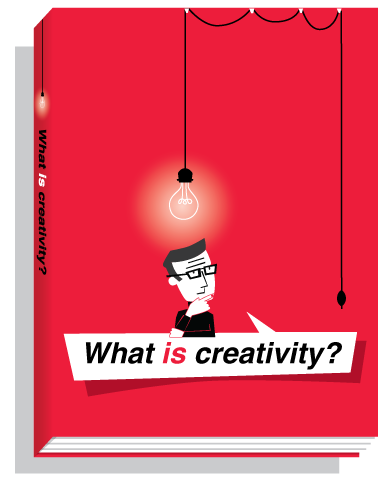 But don’t let that stop you from checking out the full text, which you can download from the Creativity 101 site. Creativity means a combination of things for me, including: clever, unexpected, unique and new. Of course, there’s often a visual or experiential component to creativity, but I think being creative is more than production of visually engaging experiences. Creativity is also the lateral and unconventional thinking that goes into solving tough problems, aka ‘creative problem solving’. That kind of creativity is absolutely essential when working in the digital marketing world – search, social, content, email, PR and ads. What would you consider the most creative campaign/tactic you have seen online? At the time, when we created the first conference eBook for Content Marketing World, it was very creative in terms of the theme, visuals and way in which content was sourced, promoted and re-purposed. To help create awareness of the Content Marketing World event with minimal resources and little time, we decided to create a ‘remarkable content object’ that would create value for prospective delegates, registered attendees, speakers and the conference organization. We developed a template around ‘secret agents’ in conjunction with ‘content marketing’. By crowdsourcing tips in character as secret agents looking to save the content marketing world, we were able to help speakers promote their participation with the event. In turn, their investment into the content object (eBook) motivated them to each help promote it. Through creative writing, visual content and communicating in character, the eBook provided a promotion vehicle for mutual benefit of the the conference and speakers, attracting over 40,000 shares and thousands of downloads in just a few days with very little budget. Not only was the content creative (and optimized for search) but so was the solution for a compelling, impactful marketing tool with few resources and budget. The eBook components were repurposed and uploaded to social networks and media hosting sites – everything optimized for search. When the conference occurred, search demand for ‘content marketing secrets’ exploded and our digital assets occupied all 10 positions on Google during the event. Since the conference, the Content Marketing Secrets eBook has been cited by numerous industry blogs as one of the best eBooks of the year. It’s also attracted nearly 100,000 views on Slideshare and sent tens of thousands of interested visitors to the conference website and our own. What is the most creative thing you can think of in the real world? Off the top of my head, I’d say things that blend form and function are really creative to me, like the Tesla Model S.
Dyson and Apple products are this way too. Where do you find inspiration for your creativity? I am always looking for patterns and trends that I can use creatively in the large amounts of information I consume every day – industry news, blogs, articles and testing. I find inspiration by looking outside of my normal work situation: movies, books, conversations, experiences. Over the past 8 years I’ve spent a lot of my time cross-pollinating my expertise (and exposure) by being actively involved in the Public Relations, New/ Social Media/Blogging and Direct Marketing industries – outside of search. As a result, many of the things I see popping up as new now in the search marketing world are things we’ve been mastering for several years. Who is the most creative person you can think of? My pop (Mike Odden) is amazingly creative. As an artist, he’s a talented painter, sculptor, potter, landscape designer, welder, and knife smith. He’s also been working with creative digital on computers years before I ever owned a computer myself. Check out the awesome Creativity 101 website Shelli made for the eBook for more information and to download. How do you define creativity? What are some brand marketing examples of creativity that you admire? The reason creativity is so important when developing a campaign is because we want to give our audience a message worth sharing.So, the point of being creative is not to come up with the wackiest idea, but finding the right method to share your message that will spark a two-way conversation with stakeholders. True, in the end all marketing needs to be accountable at some level – now or later. rational and strategic atmosphere with empathy between the team members. That’s an interesting way to put it Alexasndra, thank you.